With Indigo, more Eclipse projects will move to Git. Kudos go to the Git Task Force. I’m especially happy that BIRT and the Eclipse platform is on the list. If you need to add complex operations to BIRT reports, you have several options. One that is often overlooked is to write the operation in Java and then use the Java code in the report. This is more simple than you’d think. 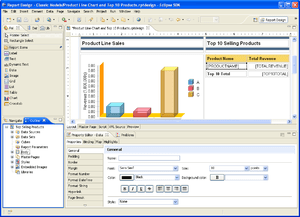 Instead of creating a “Report” project, create a Java project for your reports. Now you can put the Java code in the same project or a different project and add that second project to the list of dependencies of your report project. Note that this only works if the report project is of type “Java”. When you edit your code, you just need to save and run your report (using the various ways to run the preview). Sometimes, SQL just isn’t enough. What do you do when you just can’t get the SQL to run in under an hour while a little piece of Java code does the same query in a few seconds? Put the result into a report table and then run the report against that table. I’m a huge fan of TDD. Recently, I had to write tests for BIRT, specifically for a bug we’ve stumbled upon in BIRT 2.1 that has been fixed in 2.2: Page breaks in tables. The first step was to setup BIRT so I can run it from my tests. // Path to the directory which contains "platform"
My main problems here: Find all the parts necessary to install BIRT, copy them to the right places and find out how to setup EngineConfig (especially the platform part). I’m using HTMLRenderOption here so I could use the same code to generate HTML and PDF. I’m using several tricks here: I’m replacing a date/time string with a constant, I stabilize line ends (fixCRLF() contains String.replaceAll("rn", "n");) and do this page by page to check the whole document. Of course, since getText() just returns the text of a page as a String, you can use all the other operations to check that everything is where or as it should be. Note that I’m using MockEJB and JNDI to hand a datasource to BIRT. The DB itself is Derby running in embedded mode. This allows me to connect to directly a Derby 10.2 database even though BIRT comes with Derby 10.1 (and saves me the hazzle to fix the classpath which OSGi builds for BIRT).